GALION — A fundraiser Saturday at Victory Lanes is intended to raise money to help the family of Ryleigh Allen, who was born in February with a rare genetic abnormality. Ryleigh is the daugher of Mandy Allen, a 2007 River Valley High School graduate. Her father is Dennis Allen, a 2007 Galion High School graduate. 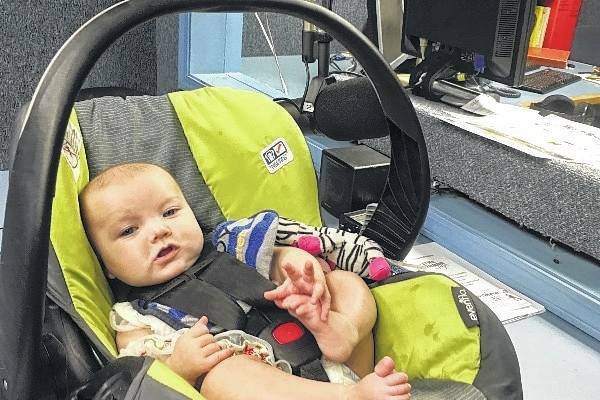 Ryleigh was born with Pierre Robin Sequence, a condition in which a newborn has a smaller than normal lower jaw, a tongue that falls back in the throat and causes difficulty breathing. It is present at birth. The combination of the smaller lower jaw and a normal size tongue means Ryleigh’s breathing is susceptable to being blocked, which is exactly what happened when she was born. “They did two minutes of CPR on her because she had stopped breathing,” Mandy said. But some nights are more difficult than others. Learn more about Ryleigh’s Quest on Facebook. Saturday’s fundraiser at Victory Lanes is from 4-6 p.m. The bowling alley owners are allowing Mandy’s family to keep part of the proceeds from everyone who cames in to bowl that day. 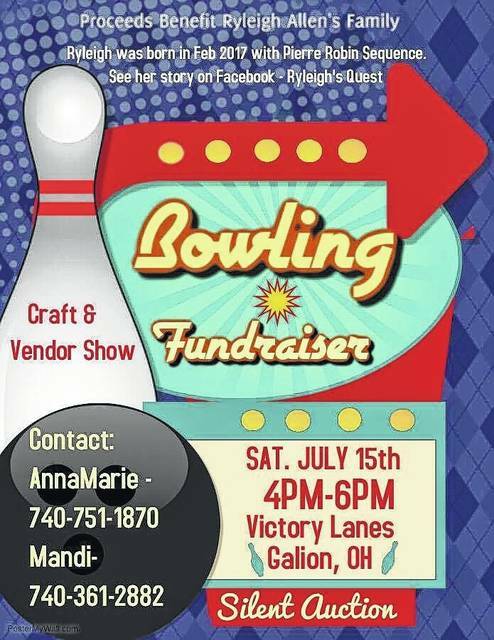 They also are allowing local crafters to set up booths in the bowling alley and the proceeds from that also will go to the family to help pay off bills and will assist with living expenses. Mandy’s phone number is 740-361-2882. You can call her or her friend AnnaMarie at 740-751-1870. Through an online support group, Ryleigh has a Pierre Robin sister named Paisley. Despite her age, Ryleigh has had one surgery already, with a second one scheduled July 28. “She is better since the surgery, but she still has some issues with breathing that we have to watch for,” Mandy said. Ryleigh was born in Marion, but is now being cared for by doctors at Akron Children’s Hospital. Due to the amount of time she spent in the hospital, Ryleigh’s dad missed a lot of time at work. It’s not been easy on Ryleigh or her family. While in the hospital, Ryleigh actually developed a drug addiction, which required a lot of monitoring as Ryleigh dealt with withdrawal symptoms. “That was hard,” Mandy said. Mandy has a son, Bentley, who is 3½ years old. Mom and the kids are undergoing genetic testing to see if they are carriers of the syndrome or this was just a fluke sort of occurrence.